Backyards Plus' staff has many years experience in the art of boulder installation and boulder placement. We offer ways for stabilizing hillsides through boulder retention when walls don't or won't work. 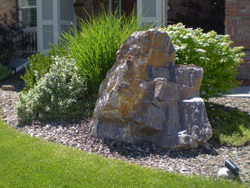 Boulder placement is also used when your landscape design requires a more natural feel.